Somebody just has to invent a smell application for computers! You know the one where, with the stroke of a key you can smell exactly what your blogger friend has just whipped up in her kitchen! ?Because if this did exist, reading this recipe you wouldn’t be able to stop hitting that key! Honestly folks, this is the most intoxicatingly fragrant recipe that has come out of my kitchen in years. Whenever I make it I don’t want that fragrance to stop. I would bottle it if I could; it’s that addictive! 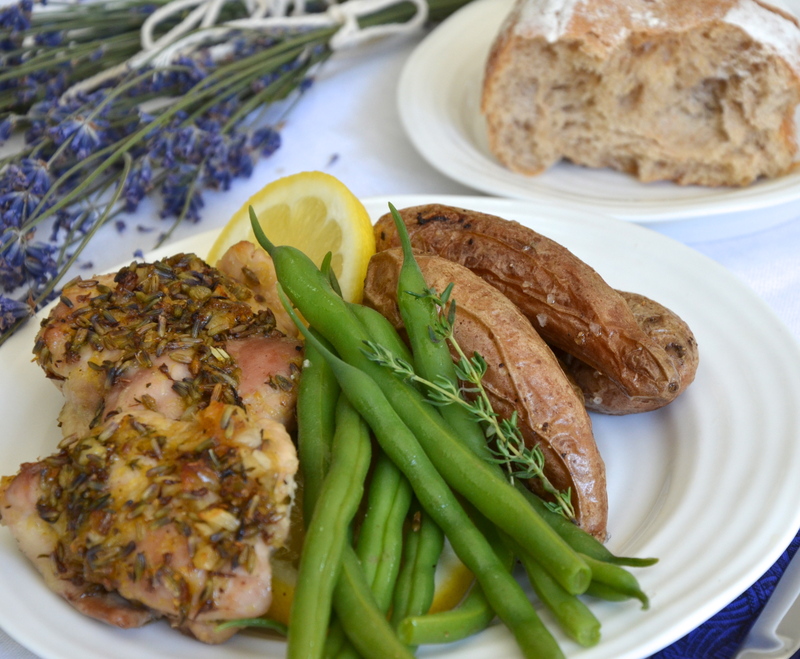 I had never thought of putting lavender in a chicken recipe, but this one is paired with lemon and fresh thyme to boot, and it is over-the-top sumptuous. I can credit Rachel Khoo for this one. If you haven’t perused her gorgeous cookbook, “My Little Paris Kitchen”, you really must. I have recently purchased it and I can’t wait to try more of her exquisite recipes. I served this up with some oven-roasted fingerling potatoes and some lightly steamed, fresh green beans. My husband and I oohhed and awed over this meal for days afterward and I am certain you will too! That’s why I am bringing a gigantic platter of this divine concoction over to Fiesta Friday, hosted by our hostess par excellence, Angie, of The Novice Gardener. Can you believe that she has been hosting us for 32 Fridays now? Angie, you are just so awesome, and I can’t believe your stamina! One note: I was worried about finding “culinary” lavender. I assume that it is just free of any pesticides and has been cleaned somehow. I was so happy to find it at my local supermarket, in with all of the regular spices. What is that amazing fragrance wafting through my kitchen? Pre-heat the oven to 400°F. Sprinkle the chicken thighs with salt and pepper and place in a baking dish. Combine the rest of the ingredients in a bowl. Mix together and pour over the chicken. Bake for 35 – 40 minutes. Serve with some oven roasted baby potatoes, scalloped potatoes or mashed and a green salad. Pass some rustic, crusty bread to mop up the sauce – you really won’t want to waste it! Do trust me on that one! This is addictive! Trust me! I too never thought of lavender with chicken, but I trust you on this one. I have a huge patch of lavender in its second year now, and just not enough ideas of how to use it, especially since I don’t do a lot of baking. This will be so fun to try. Thanks for bringing it to the party. I can feel the aroma of Lemon Lavender Chicken. I’m sure that will be just awesome too! lemon and Lavender – this I must try, it looks incredible! Well, I’m happy to report that it is a great combo! Never heard of putting lavender with chicken, but I trust your judgement 😉 Thanks for bringing it to this weeks Fiesta Friday! I love the seasonings of Chicken. Will try with something veg! Wow, intrigued and excited about the use of lavender with chicken. It looks and sounds amazing. Must try!! Let me know if you do, Suzanne! ok i have stolen this one to try aswell i like the idea of lavender with chicken v unusual! I think I can see why this meal was talked about for days, Julianna! It looks absolutely perfect. 😛 I adore the combination of lavender and lemon in baking, yet it never occurred to me to use them together in a savory dish. Thanks for sharing the recipe…it is certainly one I’d like to try sooner rather than later. Delicious! Lavender, lemon and thyme, I can just imagine the aroma when you had it roasting away in your kitchen. Just lovely! Yes, it was heavenly! Wish I could share the scent! Loved lavender infusion in here, will definitely try something vegetarian. …happy FF julianna. .. 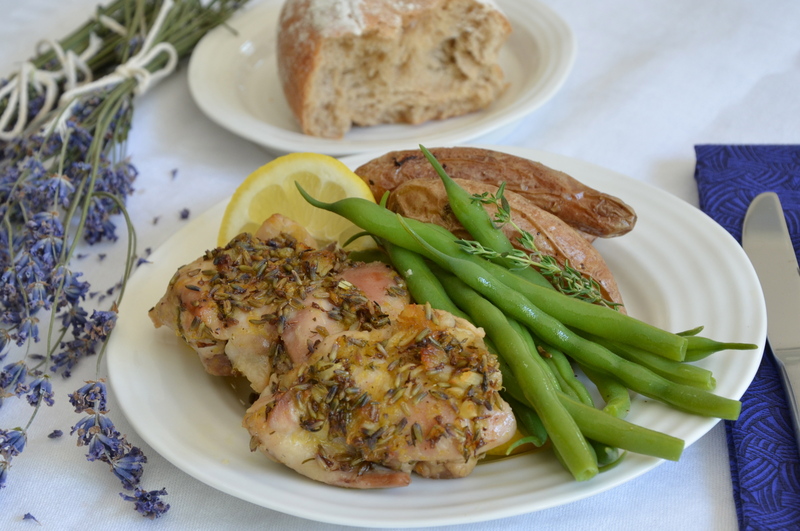 If we could smell your lovely chicken recipe, I think it would take us away to the lavender fields in France. Julianna this recipe is a masterpiece , I’m going to give it a try as soon as possibile, I’m already dreaming the smell all around my kitchen! Hmmm looks like Sunday dinner to me. 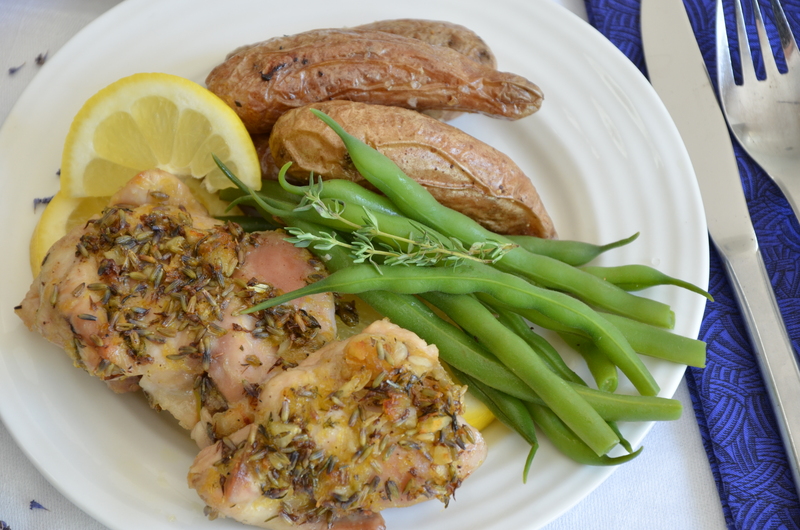 I love lemon and thyme and bet the lavender adds a fresh twist! Wouldn’t the “smell” computer button be just perfect!? I just love lavender – I keep waiting for mine to grow! lol but when it does grow I will surely make your recipe. Happy FF! Sounds and looks so amazing! How did I miss you at last weeks FF?! I don’t ever want to miss a post from you! I love that you put lavender in here! I still haven’t cooked with it, but would love to at some point! I’d be queuing up to buy such an app 🙂 Meanwhile all I can say is that this chicken LOOKS delicious! A beautiful combination of flavours going on with this dish. Lovely. If only I could have the chicken for breakfast. I’ve just woken up and I’m literally starving. Lavender is a great herb! Hi Julianna! I adore Rachel Khoo and her recipes! Thanks for sharing! The kitchen and beans look very tasty; I love the smell of lavender, thou I think it becomes less aromatic after being cooked:) Also I add to a tea!